Way back in 1951, three years before Aldous Huxley published The Doors of Perception and awareness of the entheogenic properties of psychedelics in the West was almost non-existent, William Burroughs made his first expedition to Panama and Ecuador in search of ‘yage’, as he called it, or ayahuasca, which he knew was used by Indians in shamanic rites and was said to increase telepathic sensitivity. As one of the earliest Western explorers with an experiential rather than an academic motive, he proved himself to be way ahead of his time, prefiguring a widening interest in the substance, which has now gone almost mainstream and blossomed into what we call ‘ayahuasca tourism’. That first expedition, described in Burroughs’ novel Queer, proved unsuccessful; but Burroughs returned to Panama in 1953 and this time he went on to Bogotá, where he had the good fortune to meet botanist Richard Evans Schultes, a world authority on hallucinogenic plants and a Harvard contemporary of Burroughs. Schultes told Burroughs about the methods of preparing ayahuasca, and also about the Indian mythology surrounding it and its use as a means of communicating with the spirit world. Schultes, who sampled the hallucinogenic specimens he discovered, had tried ayahuasca, but said his own experience was limited to vivid colours and no visions. He pointed Burroughs in the direction of the Putumayo River, where he would find brujos who made the ayahuasca brew. In Mocoa Burroughs met an old brujo who prepared the black liquid, oily in texture and bitter in taste. Soon afterward ingesting it Burroughs experienced blue flashes and a wave of nausea, and, though he could hardly walk, he staggered out of the brujo’s hut and retched violently. He continued to have intense hallucinations, needing to take barbiturates in order to bring himself down, and he later concluded ayahuasca was the real mind-bending kick he was seeking, though this was clearly an overdose. The further fruits of this trip were written up in a fictional letter to Ginsberg in The Yage Letters, which includes contributions from both writers and was eventually published in 1963, when entheogenic interest in psychedelics was well established. This early work depicting ayahuasca tourism went on to inspire Terence and Dennis McKenna in their own journey to the Amazon and led to their book The Invisible Landscape: Mind, Hallucinogens and the I Ching. 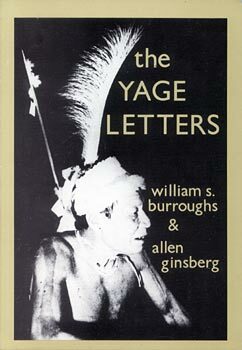 Burroughs’ ayahuasca visions were also very important in the development of his most famous novel, Naked Lunch, starting him on his unique and audacious path of literary experimentation. Read my full account of how ayahuasca informed Naked Lunch in the current PsypressUK magazine, which also includes a brief history of psychedelic research from Stanislav Grof, an account of the political difficulties of getting support for psychedelic medicine from Ben Sessa, an informative story about how Allen Ginsberg wrote a poem and turned on publisher Tom Maschler in Wales, plus reflections on Jung and Castaneda and an excellent account of a recent Peruvian ayahuasca experience from Alison Terry. More details here: PsypressUK 2013 Vol.2.